The true break-out performance of Kingsman: The Golden Circle is that of Sir Elton John, playing, of course, himself. He effortlessly steals each scene he is in. Back in 2015, director Matthew Vaughn (Layer Cake, X-Men: First Class) and famed comic book writer Mark Millar unloaded a new kind of comic book film unto the world entitled Kingsman: The Secret Service. Kingman was a slick, glossy film that wore it's R rated badge proudly. It was filled with tongue in cheek jokes, a "bondesque" villain, and cartoonish violence that when all put together just…well..worked. Now, two years later, the next title in this budding new franchise Kingsman: The Golden Circle has been unleashed on audiences and has finally come to the home video market this holiday season. After successfully saving the world from the evil Valentine, Eggsy (Taron Egerton; Eddie The Eagle) is enjoying his life as a secret agent. Kingsman has rebuilt after it's losses from Valentine, and Eggsy is living with his girlfriend, Princess Tilde (Hanna Alström; A Place in the Sun). Life seems great for him, that is until his old Kingsman nemesis, Charlie (Edward Holcroft; Vampire Academy) shows up one evening for revenge. It turns out Charlie is not working alone but is in the employment of the drug kingpin, Poppy (Julianne Moore; The Big Lebowski). In an attempt to secure the success of her plans (and to appease Charlie), in one evening Poppy destroys all of Kingsman, save for Eggsy and Merlin (Mark Strong, Sherlock Holmes). Not knowing where to turn, the two remaining Kingsman put into place their Doomsday scenario, which, in turn, leads them to their cousins in America, known as the Statesmen. When creating a sequel to a beloved film, it is very hard to hit the same mark again and Kingsman: The Golden Circle, unfortunately, does not, but it comes pretty darn close. The characters from the original film, Eggsy, Merlin, Galahad (Colin Firth; Tinker Tailor Soldier Spy), Charlie and the respective actors who play their roles are remarkable and their performances are on par with the original; however, their Statesmen counterparts, Champagne (Jeff Bridges; Tron: Legacy), Whiskey (Pedro Pascal; Game of Thrones), Tequila (Channing Tatum; Gambit) and Ginger (Halle Berry; X-Men: Days of Future Past) are a bit over-the-top and too hokey in their performances. The villainous Poppy, while not the same caliber as Valentine from the original, holds her own, but the true break-out performance of Kingsman: The Golden Circle is that of Sir Elton John, playing, of course, himself. He effortlessly steals each scene he is in and by the time you finish watching the film, Saturday Night's Alright For Fighting will be stuck in your head for at least the next week. 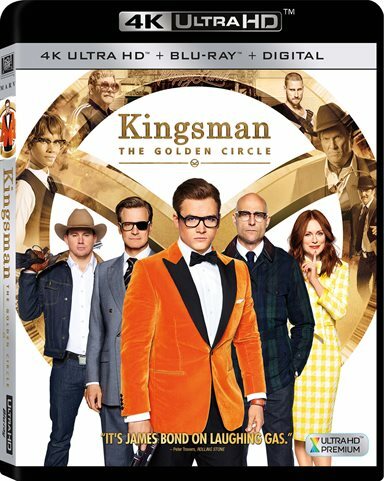 The video of Kingsman: The Golden Circle 4k UHD release is presented in 2160p with an aspect ratio of 2.39:1. Colors on the UHD release are considerably more saturated than on the 1080p Blu-ray counterpart. Colors are more "true" and black levels are almost perfect. Sharpness and detail are also near perfect, making a pleasurable viewing experience. Not only is the video superior to most releases in today's market but the audio is as well. The Dolby Atmos soundtrack found in this UHD release receives top marks as well. It makes great use of the Atmos height speakers, relegating what is generally found mixed in the front channel on the 7.1 soundtrack giving it it's own speakers on this release. Fox has truly outdone itself this time around and one can only hope they continue with this pattern. While not the same caliber as Kingsman: The Secret Service, Kingsman: The Golden Circle is a worthy sequel to the original film. Now that Fox will be owned by the Walt Disney Company one can only hope that they will continue with this franchise and a third film with the same tone that director Matthew Vaughn has envisioned will be made. Also, with an original run-time of 4 hours, it will be interesting to see if there will ever be an extended cut of Kingsman: The Golden Circle released to the public. If so, it will definitely be one not to miss. Download Kingsman: The Golden Circle from the iTunes Store in Digial HD. For more information about Kingsman: The Golden Circle visit the FlickDirect Movie Database.